Princess Letizia of Spain is in the Maryland Pink and Green spotlight as this week's fashion icon. She's probably my favorite royal and I adore her sense of style. Just like Kate Middleton, Letizia Ortiz was a commoner turned princess. She's a true post-modern princess and finds the perfect balance between being a princess, philanthropist, mother, and wife. Letizia was stunning at the royal wedding in a pale pink dress from Felipe Varela. The subtle color of the dress is a perfect choice for a morning wedding. The dress is elegant and refined. An excellent choice! Whether she's at a gala or in a garden, Princess Letizia chooses the perfect look for each occasion. She tends to choose simple designs that flatter her small waist. Her style reminds me a lot of Grace Kelly. Neutral tones suit Letizia well. The texture of the fabric and unique details make her outfits shine. Her little girls, Princess Leonor and Princess Sofia, are absolutely adorable, too, and remind me of my minnies when they were little. Letizia tends to dress her minnies in Zara and gorgeous confections from Pili Carrera. 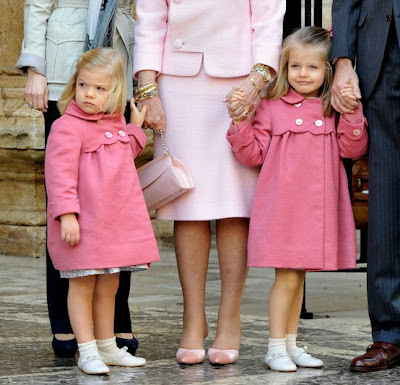 In this picture, the princesses pose for the cameras on Easter Sunday in their adorable pink coats. I've been watching Letizia since her engagement and I enjoy her sartorial choices, but I also take issue with them on a regular basis. Letizia has a habit of underdressing for the ocassion, and it drives me mad. Case in point - the photo of the adorable princesses in their Easter coats. Perfection! But their mother, spied behind Princess Sofia, chose black pants and what is essentially a safari jacket - for Easter Mass. Hello? She often wears pants, a top and a cardigan for events in which her husband is correctly wearing a military uniform, which just looks like she's not giving the event the thought and importance that is due. Letizia is beautiful and has great classic style, although she does underdress at times! The little girls are beyond precious. Love her too! Those jackets on the girls are TOO cute!!! She is gorgeous. I love all of her amazing outfits and her daughters are adorable. She's been a favorite of mine for some time, too. She is beautiful! Those girls are adorable! Thanks for posting! So elegant. I love the little girl's coats. She is so elegant and a real show stopper. She always dresses for the ocassion and makes sure her girls do too...all the while still dressing them like actual children. It is so refreshing to see little girls who actually look like little girls! Even when the princesses are at the zoo, they look precious!